The Infant Swings That Measure Longer, Last Longer for Tall Babies. When you shop for infant swings, you'll find categories like swings, full-sized swings, cradle swings and travel swings. Because even the "full size" swings don't necessarily accommodate more weight or length, all this categorizing is misleading. To us, they're all just baby swings, and we look for the longest, regardless of category. Each baby swing has different features, from music, to soothing sounds, to different speeds of swinging. But none of this matters if your baby outgrows it before the batteries even run out! Don't be too impressed by some of the features. The "soothing vibrations" can freak a baby out. The "calming nature sounds" can sound like bad radio static, and the "classical music" can sound like a toy calliope. Some of the songs are even depressing. We suggest choosing by size for baby swing safety, and long-term use, and just play a CD if you need a little Mozart. If you're still not convinced, here are how some other infant swings shake down. The first measurement listed, is the distance from the center bottom of the seat, to the top of the seat back. The second number is the distance from the center bottom of the seat, out to the front of the seat. The last, is the total inside length. The total may be deceiving though. A high back that's just for looks can be combined with an average bottom, and the swing is shorter for practical purposes. These are similar to our measurements for bouncers. Look for overall length, split more evenly and you've got the biggest growth room. Between the 12" seat, and the 30 lb weight limit, the Graco Luv 'n Hug series was most accommodating. Graco Luv 'n Hug Swings. 18" - 12" (total 30") Weight: up to 30 lbs. 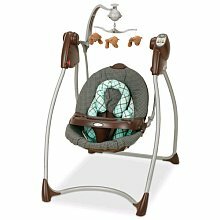 Graco Silhouette Swing. 17" - 12" (total 29") Weight: up to 30 lbs. Fisher Price Rainforest Take Along Swing. 19" - 11" (total 30") Weight: up to 25 lbs. Kids II Inc. Boppy Travel Swing. 16" - 11" (total 27") Weight: up to 25 lbs. Fisher Price Soothing Motions Glider. Works like a rocker, looks like a swing or bassinet. 18" - 22" (total 30") Weight limit: ? Fisher Price My Little Lamb Cradle Swing. 16" - 12" (total 28") Weight: ?? Graco Sweetpeace Soothing Center. 17" - 11" (total 28") Weight: up to 25 lbs. Smart Stages 3 in 1. 18'- 10" (total 28") Weight: 25 lbs, then a rocker conversion that accommodates 40 lbs. Nature's Purest Complete Comfort. 15" - 13" (total 28") Weight: up to 30 lbs.